Feeding Time With The Boozey Swine: The Classic Crisp Sandwich... and a Tasty Crisp Roll. The Classic Crisp Sandwich... and a Tasty Crisp Roll. Quite a few years ago I got a D3 in honours English in the Leaving Cert which I think makes me perfectly qualified to write an essay on crisp sandwiches. Invented in Ireland approximately 40 minutes after the crisp itself, the Crisp Sandwich is something of a delicacy. Very simple to make, a bag of cheese and onions crisps... I won't hear of other flavours being used, and a couple of slices of buttered bread. 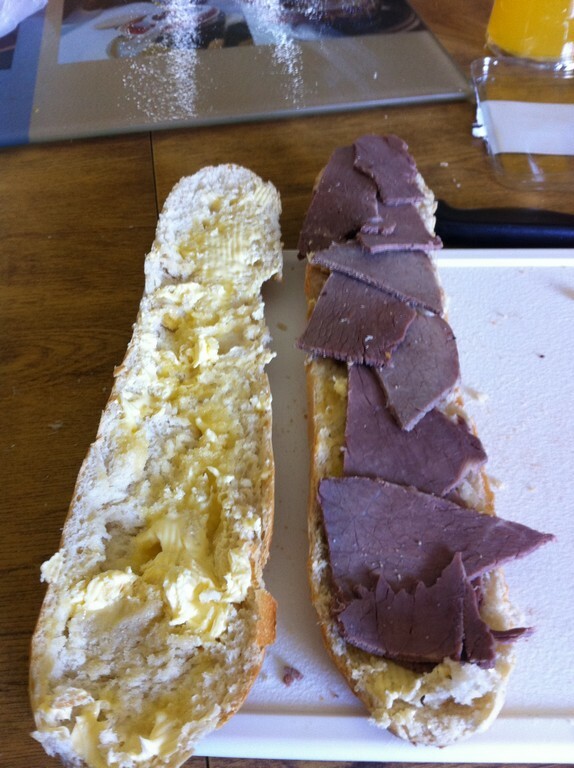 Now of course everybody has their little preferences of how they like to make their own, some like to crush up the crisps beforehand, most like white bread, some like wholegrain (me) and some people use only one slice of bread with a handful of crisps and do a fold over! Then there's the debate of what brand of crisp to use, some like Tayto, most swear by King Crisps for use in a sandwich, I on the other hand have, quite controversially, switched to an overseas brand... Walkers... An absolutely delicious crisp which I have nothing but nice things to say about apart from the fact that the Cheese and Onion flavour are packaged in a blue bag which any Irish person brought up on Tayto and King will associate with Salt and Vinegar. Sort it out Walker. Some people also like to put mayo or ketchup on their crisp sandwiches but there'll be none of that carry on round here. Crisps can also be used as a very tasty addition to an already completed sandwich, throwing a bag into one of those pre packaged garage sambos really adds a bit of life to them. What I'm gonna do now is make a very quick and simple roll with a bag crisps in it to give it a bit of a kick. 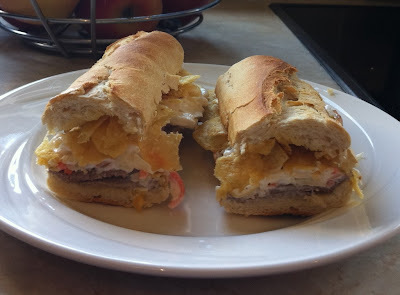 Something I discovered is quite delicious is a roll with just roast beef and coleslaw, a good sandwich doesn't need a lot of ingredients, you just have to make them count! One day I had a few crisps with one of these rolls and it really set it off so here's how to make it..
Get yourself a standard roll, the bake at home ones are cheap, last for ages and only take about 10 ﻿minutes in the oven. 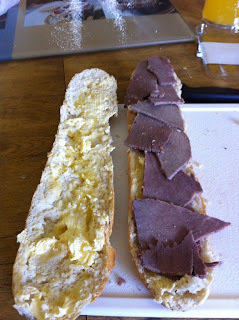 A bit of sliced roast beef out of the deli or get the packet stuff, some coleslaw and a bag of cheese and onion crisps. Of course this is only one of thousands of great ways to add crisps to a sandwich, something I'm sure I'll revisit many times in the future, any suggestions or anything you'd like me to try out for here as always just let me know﻿. 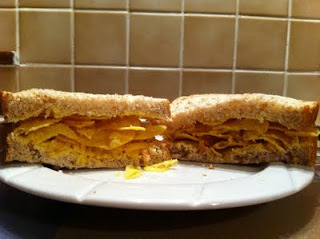 I love crisps sandwiches, which were introduced to me by my friend. 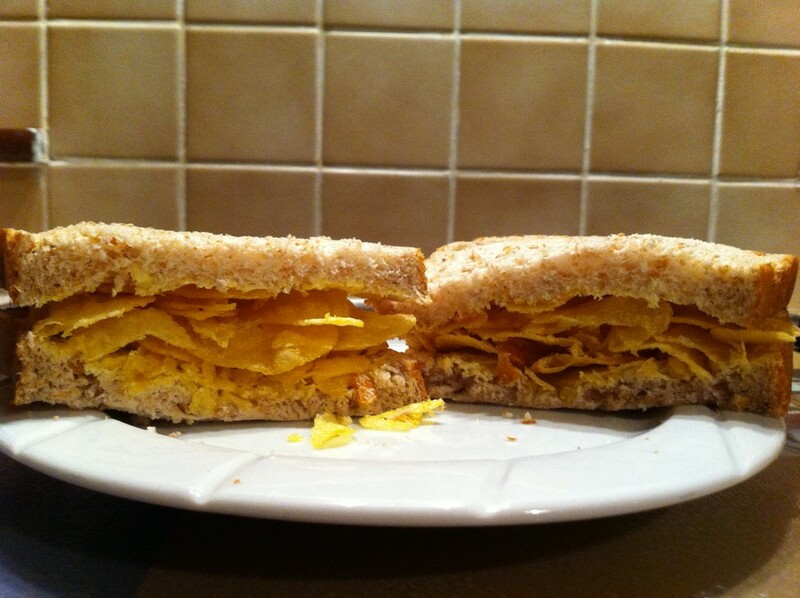 My classic crisp sandwich consists of buttered white bread and Walkers salt and vinegar crisps. I have heard of a variation where a slice of processed cheese is added. Walkers cheese and onion crisp did originally come in the green packet but was switched to the blue packet years back, it was quite confusing at first! Curry Cheese Chips... as they should be.